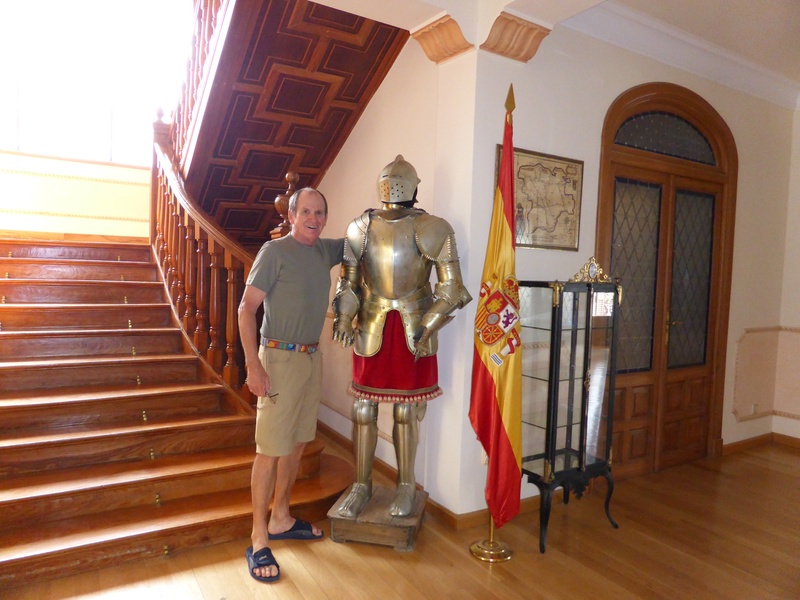 Our hotel is an old rural manor – with historical family pictures and memorabilia everywhere; both military and from the bull fighting ring. 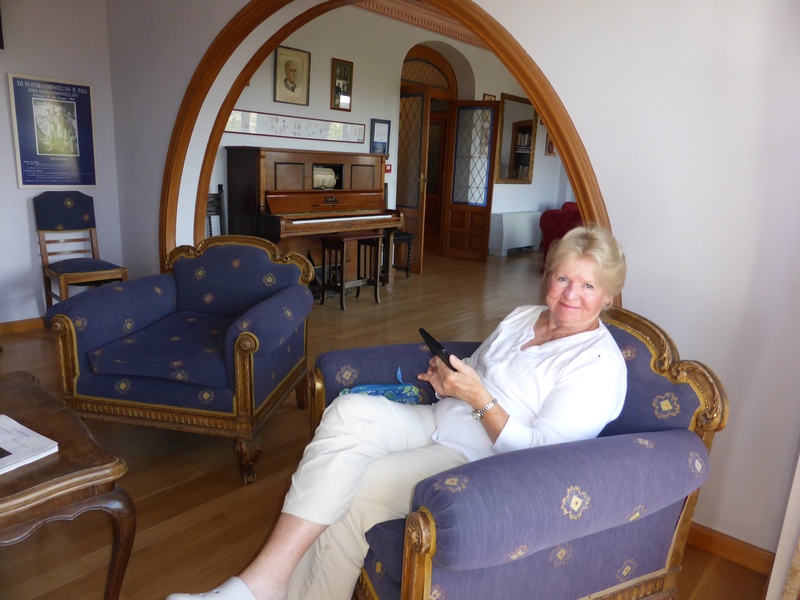 There is the blue room and the red room.. here is Mutti relaxing in a room filled with history. That’s a player piano in the background. Thats the castle we were going to walk to…. 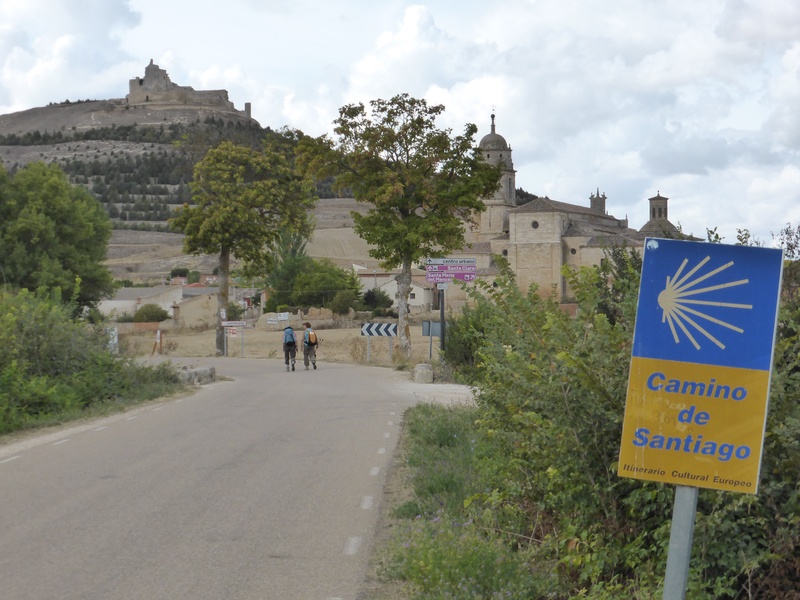 yes, it shows how walking the Camino can change your attitude about a ‘little hill’ ! It has been an overcast day with a strong, cold wind gusting through the village. We were out and about when the rain started but conveniently took refuge in a little cafe and waited out the rain drinking cafe con leche. A hill/small mountain looms over Castrojeriz with the ruins of a huge Roman castle on top. We had planned to hike up there this afternoon but decided we did not wish to be caught in the wind and rain. So, we took a nap instead…always a good alternative. Actually, it was a culturally correct decision. At 2 pm in Spain shops close their doors until 5:30pm for siesta. The shops then remain open until 8pm. 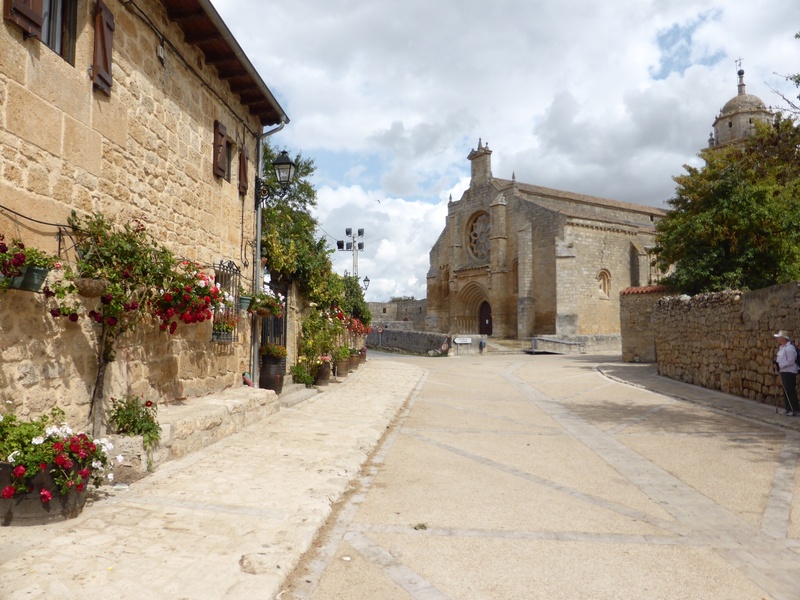 The towns and villages assume almost an eerie quiet during this period. A very kindly cleaning lady gave us access to the hotel washer and dryer…..which saved us a lot of time …besides our clothes would not have dried outside. It looks very much like we will be walking in the wind and rain tomorrow. This is our last day on the Camino until we return next year. One day of walking in inclement weather makes us very fortunate pilgrims! Castrojeriz is an interesting town in that it seems to be one very long Calle Major (main street). Also we now begin to see the first of pueblo type construction with mud bricks replacing stones. The pueblos are characteristic of the Meseta.